Well a lot has happened since our last update. Last saturday we had to leave Tortola as our 28 day Visa had expired. We went to St Thomas for the day because that was the easiest, so we could get a new visa on re entry. On Sunday we caught the Ferry to Virgin Gorda (meaning fat virgin) and spent a day there. Our first impression was of a Caribbean island that was as we imagined. Not caught up in the chase of the tourist dollar. It is beautiful and the people are very friendly. Not overly developed at all. We were there on a Sunday not a soul to be seen, all the locals were at church. We went for a wander around town and then hitch hiked to The Baths. The guy who picked us up was not even going that way but still gave us a tour of the southern end of the island. even showed us where a cricket match was to be played later in the day -The Baths (check the photos on the web site when we get them up) is the most popular attraction on Virgin Gorda and absolutely beautiful, with great snorkeling and fantastic caves to explore. We decided to hire some snorkeling gear and have swim, we ended up perched on a rock enjoying paradise. A couple of rastas pulled up and decided to share the rock with us. They were from St Lucia and lovely guys. They insisted that because we shared our rock that we had to share there beer and rum, how could we refuse. After an hour or so they moved on just after we caught up with a couple of Aussies. You would not believe it the lady, Del was on the exact same flight as us from Brisbane and her friend David had done quite a bit sailing with Mike Job from RQYC. Mike was my RYA examiner. After chatting for a while they invited us to sail up to the Bitter End Yacht Club in North Sound with them (approx 12 mile to the other end of the island) and then stay the night on there Sunsail hire boat. They took us to dinner at the BEYC filled us full of Rum and Beer and then insisted on paying, again how could we refuse! After dinner we were invited for drinks on another charter boa called Banana Twist with 2 Americans, also very friendly insisting we drink more with them (just what we needed). We did have some trouble finding the Banana Twist in the dark so we drove around the bay at midnight yelling out BAA-NAA- NAAAH at the top of our lungs and funnily enough got an invite from another boat to come aboard and party. We woke early the next morning both feeling like crap knowing we needed to get back to Tortola to prepare for our trip to St Lucia. The thing we will really remember Del and David for is there gift, a tube of Vegemite! Any way back to Tortola. We had lots to do and many people to thank and say good buy to. I had to get a hair cut as a condition of employment which I put of to the last minute. We managed to get a flight booked to StLucia 7/3/05 Alby Well we have been in St Lucia living on the boat in Marigot Bay for nearly a week now. There is an overwhelming amount for both Melanie and I to learn. There are so many systems, 3 air-conditioners, genset engines, fresh water, hot water, refrigeration, freezer (there is a 12 volt DC, 110 volt ac and an engine driven system for the freezer) and they all need regular maintenance. The help down here is very thin on the ground, you pretty much have to be able to manage every thing yourself. Getting people to work on things is really tuff and getting parts is even harder. We have many little maintenance issues, nothing that will threaten the safety of the boat just things that make it difficult to give people the sort of service they expect when they are paying over US$3000.00 per day for the charter. We have a nasty clunk in the transmission on our port engine. The mechanic said there was a spare in the supply room and I could change it if I wished. Yeah Sure!! He said it was his job to maintain the bare boats and as skipper of a crewed boat all the maintenance was my responsibility. On a brighter note we have met a couple who are running a Moorings 6200, what a mighty boat. Stewart from the UK and Chante from South Africa. They are right into Kite surfing and Stewart had a Banjo. They have been really helpful, kind of taking us under there wing and showing us the ropes. We took the boat up to Rodney Bay just up the coast for the weekend and had a great time up there. Its a really beautiful harbour with lots of little beach front bars and a lovely beach. It is really strange, no one seems to care to much where we go with the boat between charters as long as we get the maintenance done and have the boat prepared for charter. It is really like living on your own boat. 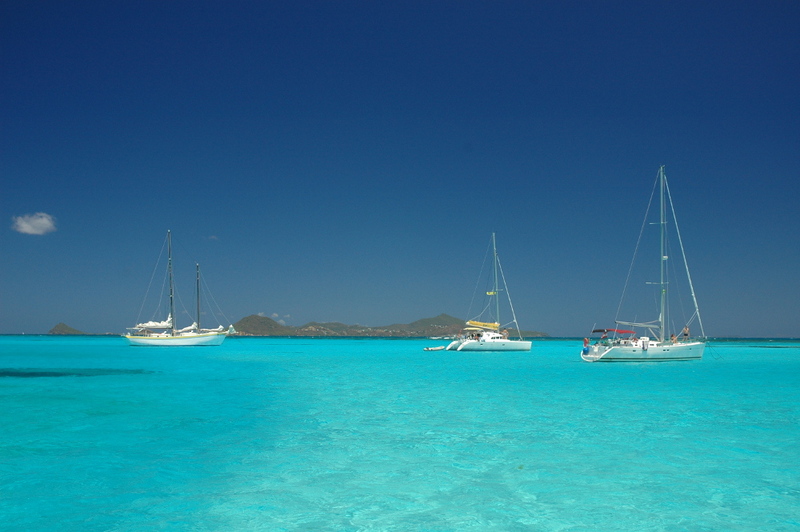 We arrived back in Marigot Bay today and plan to head down to Canouan on Wednesday and explore the region we will be chartering which is The Windward Island Group. St Vincent, Bequea, Tobago Keys, Mustique etc. So More Soon Alby & Rocket To Bob and Charlsey – How things change, I have had a hair cut, have to shave every day and spend half my time up to the elbows in grease in a sweat box of an engine room. Is this a REAL JOB? Well we have a job! We start pretty much as soon as we can get to St Lucia, which will probably be next Tuesday or Wednesday. We will have approx. 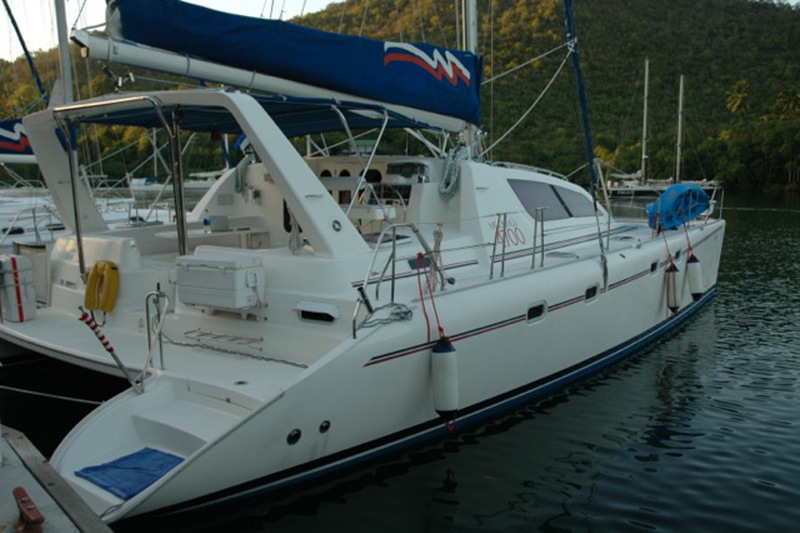 2 weeks in St Lucia before our first charter to familiarize ourselves wit the boat and the area. We start being paid as soon as we get down there and we can move onto the boat straight away. The boat is a 47ft Robertson and Caine that is custom built for the Moorings. Its known around here as a moorings 4700. It has 4 cabins, 4 heads, 2 50 hp diesels, 3 air-conditioners and a Gen set. The galley is really well equipped with a great oven and pretty much every appliance you would be likely to need including a microwave. It seems like it should be a pretty nice boat to work on. Its less than 12 months old and apparently really well maintained. Melanie and I did some sensational diving over the last couple of days. We had 2 dives on the Rhone which were fantastic with approx. 30 metre vis. 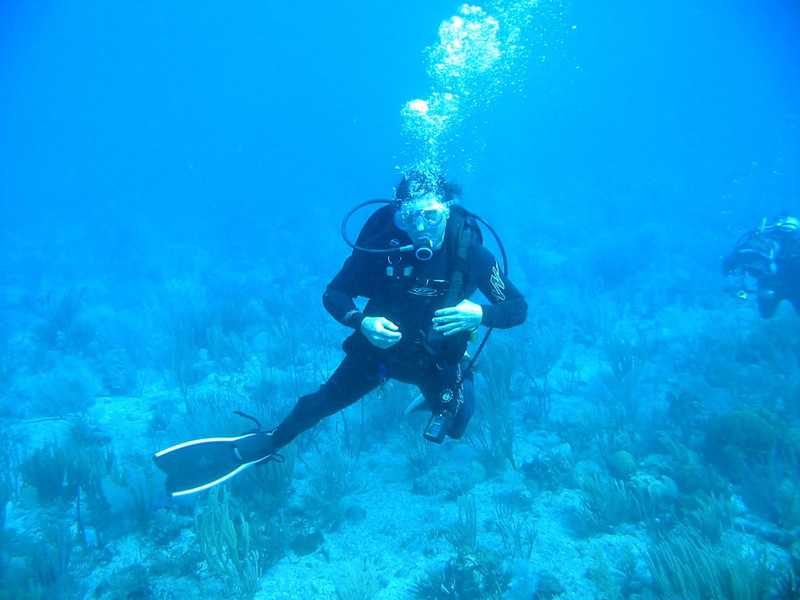 then he next day we had 2 dives on some fantastic coral reefs near Ginger Island. Vis was about 25 metres. We got a really good deal on the boat we did the Photo course dives. They gave us local rates which saved about 1 third. On all 4 dives we encountered a huge variety of colourful tropical fish and stunning corals, just what you would expect in the turquoise gin clear water. So all is looking up at present and we are looking forward to getting established on the boat. We have a fair bit to do over the next few days in preparation.